The crazed colonel on the move in Chad. Colonel Muammar Qaddafi is on the move again in Africa. This time his chosen battleground is Chad, a desert country of 4.5 million people scattered through a territory twice the size of France. The confusion and hesitation evident in French and American reactions to Qaddafi's newest adventure are more understandable if viewed in terms of the three complex fronts on which Qaddafi conducts this war. His intent is not simply to depose one Chadian tribal leader, Hissene Habre, a former "rebel" who now enjoys Western blessing, and reinstate another, Goukouni Oueddei, now a rebel, formerly the "legitimate" president in the eyes of many Africans, and of the United States and France as well. 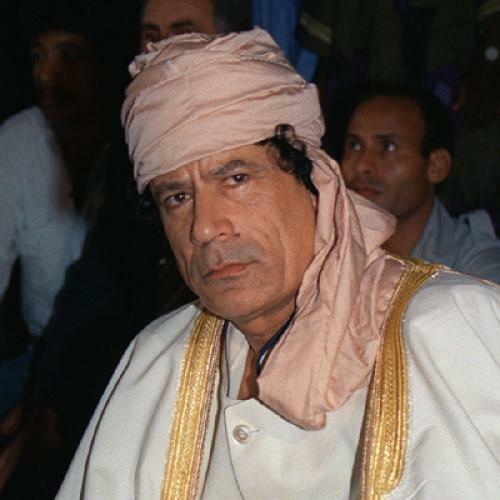 Qaddafi is fighting against what he considers "reactionary" and "neo-colonial" regimes and relationships in both Arab and black Africa; against French influence; and against American pressure, represented by the Reagan Administration's troop, air, and naval movements in the Mediterranean, Sudan, and Egypt. Close neighbors of Qaddafi like Algeria, whose government quietly detests his unpredictability, and Tunisia, which recently resigned itself to Qaddafi's first visit since March 1982, fear that Qaddafi's third battlefront—the one against the United States—could sharpen superpower tensions both north and south of the Sahara. In military terms, Qaddafi's Soviet arms and his eighteen hundred or so Soviet military instructors, as well as his East German security personnel, are less of a concern to NATO's southern headquarters in Naples than are the air bases which the Soviets have built for Qaddafi in Libya, and which they use themselves. Another worry is Libya's increasingly mobile navy. Fast Soviet-made missile boats and the SX-404 submarines Qaddafi has bought from Italy, especially designed for covert delivery of frogmen and underwater explosives, are useful against anchored ships, port installations, and oil-drilling platforms or pipelines. On his Afro-Arab front, Qaddafi's Chad campaign is a reaction to his having been snubbed by the Organization of African Unity last year (the result of a dispute about accrediting the Polisario guerrillas), which deprived him of his chance to take his normal turn as O. A.U. chairman. But Qaddafi hesitated several months before finally attacking in Chad. Senior Libyan army officers were reluctant to repeat their costly 1980-81 invasion of Chad (begun, and ended, at Goukouni's request) or the disastrous Libyan military expedition to Uganda in 1979, when Qaddafi attempted to prop up Idi Amin, the former dictator, against the invading Tanzanian army. Also, Qaddafi delayed the Chad expedition while he made fence-mending trips last June to North Yemen, Saudi Arabia, Jordan, and his ally Syria, and even a surprise visit to King Hassan of Morocco, a sworn enemy. And there are indications that he was carefully watching a Tunisian initiative to revive the old "greater Maghrev" idea of an economic federation of Tunisia, Morocco, Algeria, and perhaps Libya, to see if it could be turned to his advantage. Related to these aims, and linked to Chad, was a secret Qaddafi effort to end—on Libyan terms—the Western Sahara war between Morocco and the Polisario guerrillas. King Fahd of Saudi Arabia, once again on speaking terms with Qaddafi, apparently told him that Saudi Arabia was anxious to cut down its massive payments to Morocco for prosecution of the Western Saharan war. If Libya would reduce its arms and cash supplies to the guerrillas, Saudi Arabia and Morocco would look the other way when the Qaddafi-Goukouni team made its move in Chad. Egypt and Sudan, despite their long history of conflict with Qaddafi, were relatively discreet. President Hosni Mubarak of Egypt declared in no uncertain terms that the joint U.S.- Egyptian "Bright Star" military maneuvers now underway could not be directed against Libya. Sudan did accept the two U.S. AWACS planes sent there to watch Libyan air movements, but their use depends on more effective U.S. electronic communication links with French "instructor" forces in Chad than have been established at this writing. However, Zaire's President Mobutu Sese Soko, lately a guest of President Reagan and President Felix Houphouet-Boigny of the prosperous but wary Ivory Coast, were quick to condemn the Qaddafi adventure in Chad. Mobutu, who faces a little-noticed but quite serious insurgency at home in Saba Province, and who has some Israeli military advisers, was the first to send troops to support President Habr6. He would not have done so had the United States and the Saudi-led Arab conservatives been willing to drop Habre. This move showed that the suggested Qaddafi-Fahd accord had already broken down. Another cause for delay was Qaddafi's continued meddling in the Middle East. In Beirut on June 5 a man suspected of being a Libyan agent tried to kill the Libyan charge d'affaires for Jordan, apparently to prevent the diplomat from disclosing details of Qaddafi's support of the anti-Arafat P.L.O. dissidents in Lebanon. Libya's ambassador to Jordan, Azziz Omar Al-Shuneh, then defected, charging that Qaddafi was planning to murder both Arafat and King Hussein of Jordan. Shuneh also supported suspect claims that the missing charismatic leader of Lebanon's Shiite Moslems, Musa Sadr, was killed by Qaddafi's security men in Libya in 1978. Sadr's disappearance in Libya is the main reason why Qaddafi's constant efforts to move closer to the AyatoUah Khomeini have met with less than spectacular success. Thus isolated in the Arab arena, Qaddafi launched his calculated challenge to Francois Mitterrand's support for Habre, support based on a 1976 French-Chadian pact that does not provide for the same degree of military assistance France offers to potential "domino" neighbors of Chad, such as Niger (which produces uranium which is vital to the French nuclear program, and which Qaddafi also buys for his nuclear power and his clandestine weapons research), Cameroon, Senegal, and the Central African Republic. Qaddafi's calculation that France would not go beyond sending in supplies and a few hundred paratroop "trainers" was founded on France's thirst for Libyan oil. In 1982 Libya was France's fourth largest oil supplier, with 4.2 million tons, 54 percent more than in 1982. Both French and U.S. analysts figured that neither France's Jaguar fighter-bombers, on standby in neighboring states, nor the U.S. carrier Eisenhower's F-14s would be needed, provided Qaddafi stopped after capturing Faya-Largeau, the big oasis guarding approaches to both the capital at Ndjamena and to the newly established French base near the Sudanese border, Abeche. Qaddafi has been trying to remedy his most serious logistical problem since before he allegedly attempted to use Billy Carter in 1978 to release C-130 transport planes on order but being held in Georgia. The transport planes were important in moving troops and equipment farther south. The Reagan Administration successfully foiled Qaddafi's efforts to buy Australian-owned C-130A Hercules transports. Qaddafi still has seven C-130H Hercules transports flown mainly by British and other European mercenary pilots, some of whom are old friends of Edwin Wilson, the convicted ex-C.I.A. Qaddafi supplier. These planes are supplemented by six Soviet-supplied Ilyushin 76 freighters and two Lockheed Jetstar executive jets, as well as some Italian G-222 transports. Qaddafi is currently trying to buy Brazil's Xingu trainer-attack planes, and the United States is doing all it can to block the deal. The Reagan Administration's visceral dislike of Qaddafi is due partly to irritation over the kid-gloves approach of past Administrations and partly to his extension of aid to the Sandinistas in Nicaragua, as well as to such operations as the large-scale Libyan effort to smuggle arms to Colombian guerrillas, foiled in Brazil last April when three Libyan planeloads of arms were forced down. The 1981 "hit team" saga—which led the Reagan Administration, initially on the unreliable word of a Lebanese informant seeking a C.I.A. pension and a C.LA.-provided house in McLean, Virginia, to fear attacks on the President and other senior U.S. officials—still rankles in Washington, where memories are often short. However, Chad seems unlikely to be the arena where the United States confronts its North African tormentor, and finally bashes him. Chad is more likely to force upon President Mitterrand the unpalatable choice of a deal with Qaddafi (thus avoiding losing Libyan oil and Libyan arms purchases in France) or seeming to accede to American wishes to get tougher with him. Qaddafi has lately acquired one new friend in Francophone Africa, the leader of the successful coup in Upper Volta, Captain Thomas Sankara, whose "revolution" takes its place alongside that of another Qaddafi friend, Ghana's Flight Lieutenant Jerry Rawlings, both of whom are more of a psychological than a real threat to their conservative anti-Qaddafi neighbors. These neighbors, for the moment, are hoping that Qaddafi's whirlwind will blow itself out against the rocky escarpments of northern Chad's Tibesti Mountains, and not invade the fertile African plains and savannahs to the south. John Cooley, a London-based correspondent for ABC News, is the author of Libyan Sandstorm (A New Republic Book/Holt, Rinehart & Winston). This article originally ran in the September 5, 1983, issue of the magazine.